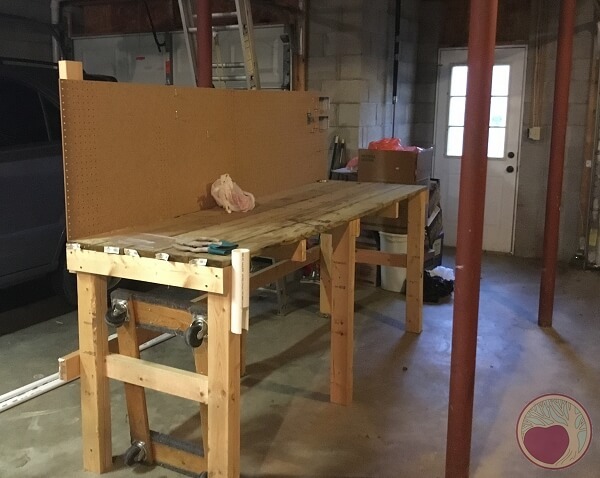 I finally have a place to build a real woodworking shop for my new wood decor art creations. 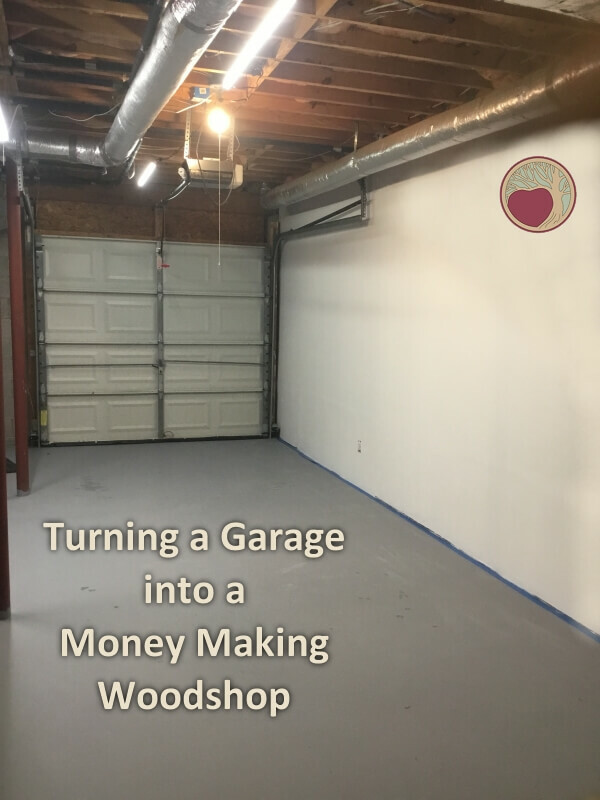 I’m starting from the floor up, literally, to turn a garage into a shop for building everything from the work benches to new wood art decor, plus recording how-to videos and tool reviews as I go. I hope you’ll come along on this journey with me. You’ll pick up some nice money-saving tips and cool tool and gear ideas along the way too. I’m thrilled my new house has a basement! About 560 sq ft is finished and I’ll be using that as an art room, which I’ll share with you as soon as I get the rest of the moving boxes out of there. The rest is an oversized two car garage. I’ll be using a little over half of it for my workshop. The area shown here is about 400 sq ft of it. I’ll be using the main area on the right for builds. 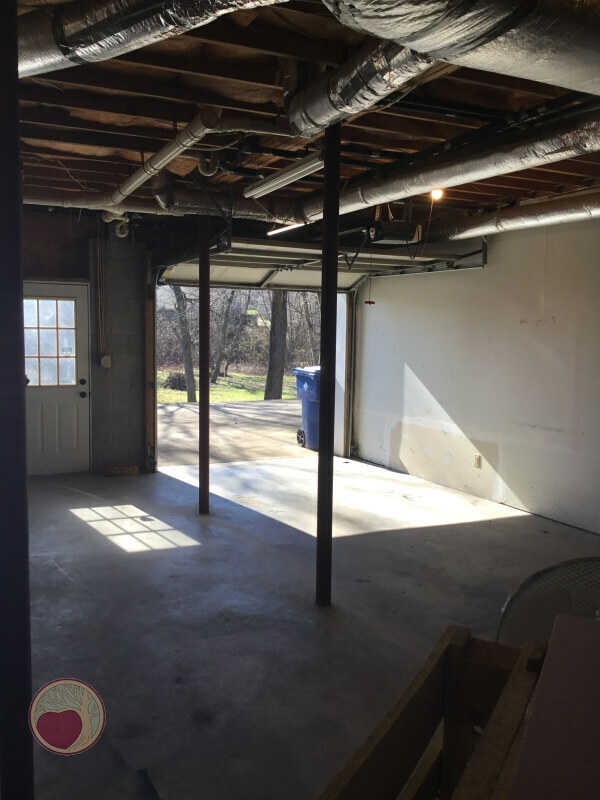 The area between the poles on the left will likely be where my benches and big power tools stay most of the time. Below is a shot of the bench that came with the house. It’s in that between-the-poles area to give you an idea of the space. And oh my gosh, yes, I will be building my own bench! This one was definitely a throw together from scrap lumber, which is what it will turn into again at some point. 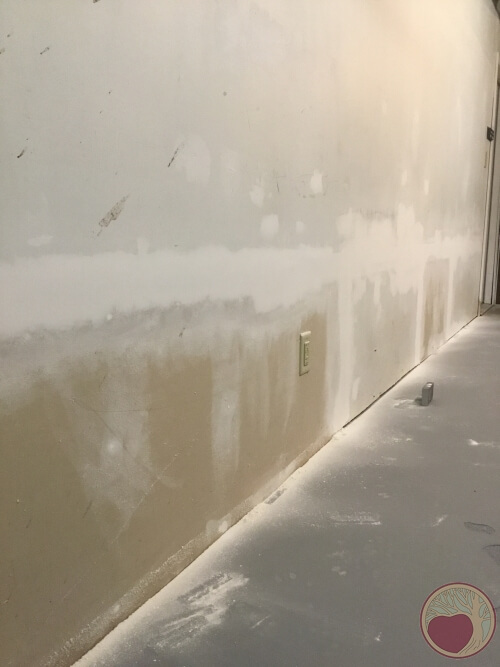 As you can see below, there was a lot of drywall patchwork on the wall. The wall was actually in a lot worse shape than you can see from this angle. And this is after I started mudding and sanding to make it better. 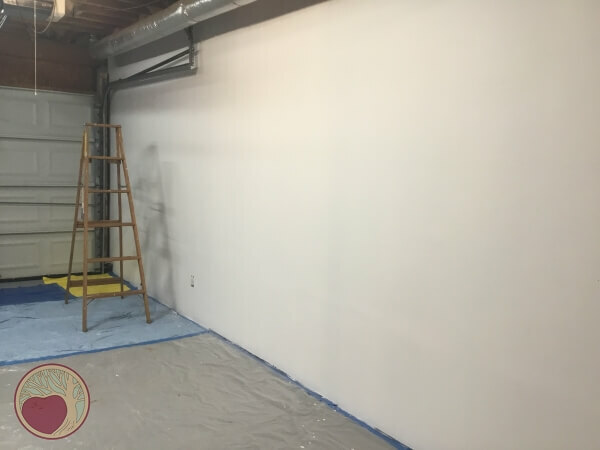 The patchwork sheetrock was done by the previous owner who finished the art room on the other side. And it looks like they tried to wash something in the drive outside that splattered all over the wall too. It did not scrub out. But, they also ran an electrical outlet for that wall, thank goodness! There are other outlets in the garage, but they are all on the ceiling. I thought maybe hanging one of my blue nylon tarps would work for a backdrop on my videos. It’s okay. But I think a freshly painted wall would look a lot better. But, it’s winter. And the average temps for TN are 40-50 degrees during the day. The shop is a little warmer than that. So, every time we had a few nice days in a row, I was busy doing a LOT of sanding and mudding. Oh My Gosh That Floor!! 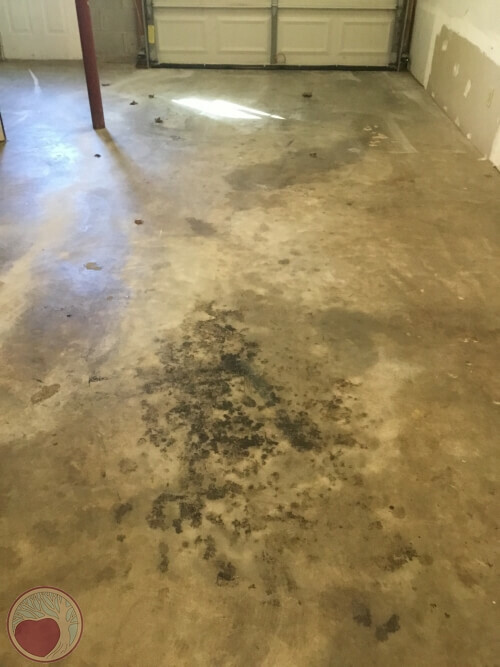 I don’t know what all the previous owners did on this side of the garage, but there is every kind of stain imaginable!! Oil, rust, paint, and a few other things I can’t even identify. 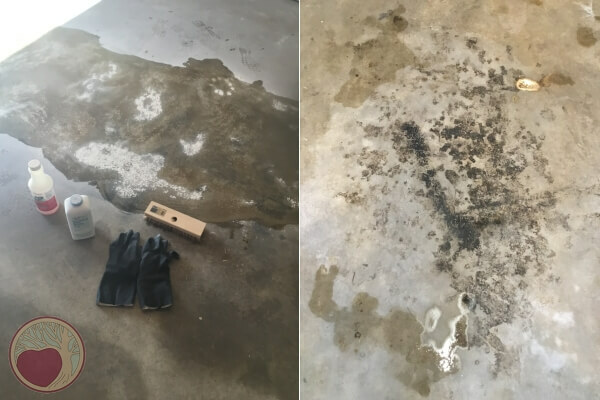 I tried TSP and baby powder, then a pressure washer and it made a bit of a dent in the big oil stain. But the whole floor is still so motley that I had to call a pro in to do a deeper clean. And then they painted it with a nice gray epoxy to seal it. 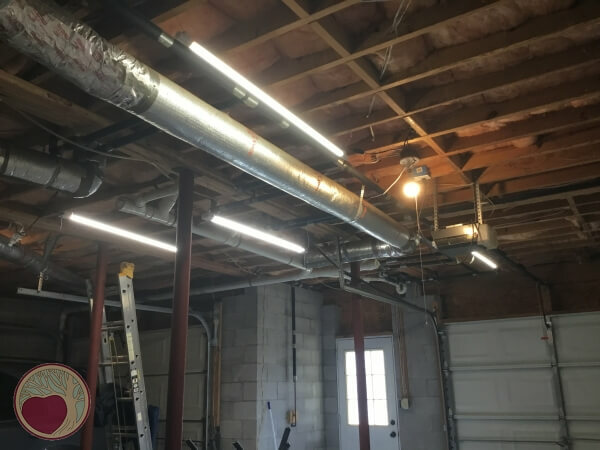 There were 4 CFL bulbs in the whole garage. I hate those flickering, humming things!!!!! So, the first thing I did was change them all out with 1600 Lumen LED bulbs. Wow! Did that ever make a difference!!! 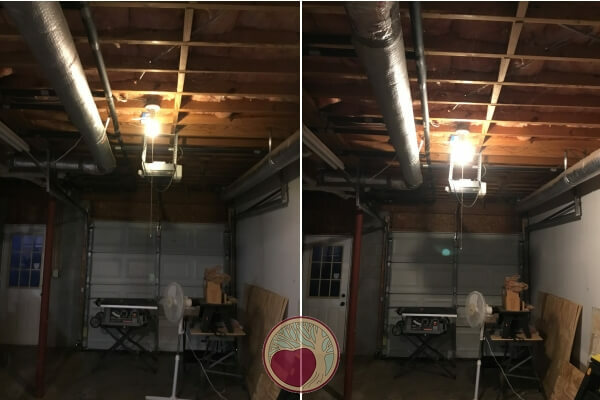 Below is not a great shot, but you can see the brightness difference between the CFL and the LED by how much more light it cast into the space. I really like the soft white, and that color temperature matters for video and still shots. It keeps everything warm looking – and that’s good for me and the wood. But, just one good bulb in the middle of the main work area left shadows everywhere. I plan to have my table and miter saws by the garage door so I can cut with the door up and blow the sawdust right out. But that means at night, my back will be to the light and I’ll be casting a shadow on the cutting area. So, I got these bright white LED bar lights and ran them lengthwise on each side of the bulb. They REALLY lit up the whole work area nicely. I went back and got 2 more of them to run lengthwise between the poles so my workbench will be well lit. That will also serve to illuminate my face and tools from the front for video tutorials too. My camera will be near the bench side, by the poles, and facing the white wall backdrop, with me in between. Here are all 4 new bar lights, and the LED bulb. It’s hard to show just how bright it is in the room, but you’ll see it in the new videos. I’m thrilled with the difference in the floor! Yes, that’s the end of the paint line. I couldn’t afford to have the whole garage done yet, just the shop area. The little dark spots were places the previous owner tried to fill in, but didn’t smooth well, or chip outs, and I’m okay with those. Again, they really only show up from wide angles like this. I’m so happy with the wall!! 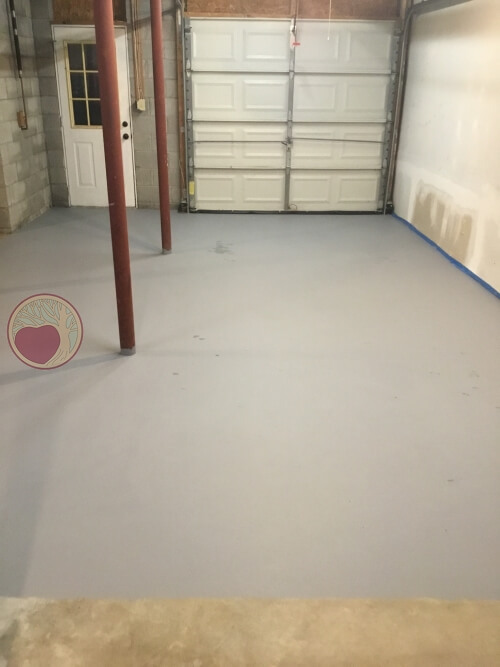 You better believe I took great care to protect that new floor while putting on primer!! It took 2 coats of Kilz2 and 2 coats of paint and you can still see the mud lines a bit, but only at certain angles and lighting. Straight on you can’t see them at all, and I’m fine with that. The dark streak down the middle is a shadow from one of the poles. Can’t see that when straight on either. I got the LED bar lights on sale for $12 each, which was half price. 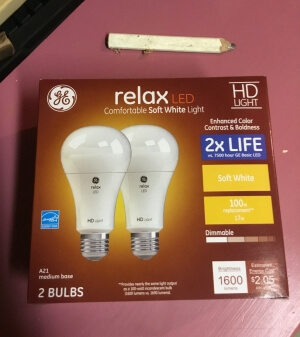 The LED bulbs are not cheap either, at $12 for a 2 pack. But the nice thing about LED lighting is that it lasts for years. Plus, it costs pennies to operate compared to regular incandescent bulbs. I already had the mud for the wall. A gallon of Kilz2 plus a gallon of paint was around $30. I tried to make a video tool review with the blue tarp backdrop, and that wasn’t so bad. But any shot of the floor was a huge distraction. And the tarp thing just looked odd. The niche for woodworking/DIY sites is a crowded space online, and I’m competing for eyeballs. I don’t intend to shoot for HGTV film quality, but there is NO WAY I can afford to have a nasty looking space on videos that I know are going to attract several hundred thousand views. I’ll make more money in the long run if I invest in my success now and have a decent looking shop. I’m also going to be more comfortable building stuff in a clean, happy space too! I’m chomping at the bit to get going with my builds and videos. And all this cleaning has been a financial hit and time delay. But, I’m positive it is the right move to make now rather than later. I’ll keep you posted on the new shop progress. And I can hardly wait to share my new tools with you!!! It is so nice to hear all the details. Explaining to your readers about how investing now reaps huge rewards right away is a great motivator for me. I can’t wait to stay in the loop as you grow your business and reap the benefits of creating things exactly the way you want. These are hands on benefits that will boost your confidence along the way! Thanks, Marilyn!!! It really is boosting my confidence as I go. There is so much to do and it feels so good to check things off the to do list, especially when they are fun things!! Congratulations, MaAnna, for getting this far, despite the setbacks. This is going to be a fascinating journey to follow and I wish you well in this new venture. Can’t wait to see the new videos! Thanks so much, Lin. It was disappointing to lose a month of blogging, but I am so proud of the space I have to create in now. Well worth it!! Beaming with joy as I read this detailed account of the journey you’ve so generously shared with us on Facebook this winter. Looking forward to watching your creations produced in this special space. Thanks so much, Barb!!! I appreciate you joining me on this journey. Cheering you on, MaAnna! We changed our garage into an art studio a few years ago. Thanks for the coming to me at the right time. I have been thinking to open a woodworking shop. So, I found you with helpful. Hope so your ideas will work for me.